And welcome to all our new newsletter subscribers. We have lots of work in the pipeline here at First Steps and hope to have a number of new resources and statements in the coming months. But this month we have some good news, which we are sure most of our readers have already heard, and also report on plans for the Baby Feeding Law Group which we are secretariat for in 2019. In the last month we had some welcome news from the BMJ group of publications that they would no longer take advertising from the breastmilk substitute industry. You can read their rationale here. Many people will also have seen the Channel 4 Dispatches programme ‘The great formula milk scandal’ which can (until April 17th) be accessed here. This has also sparked some interesting further work which we hope to report on in due course. 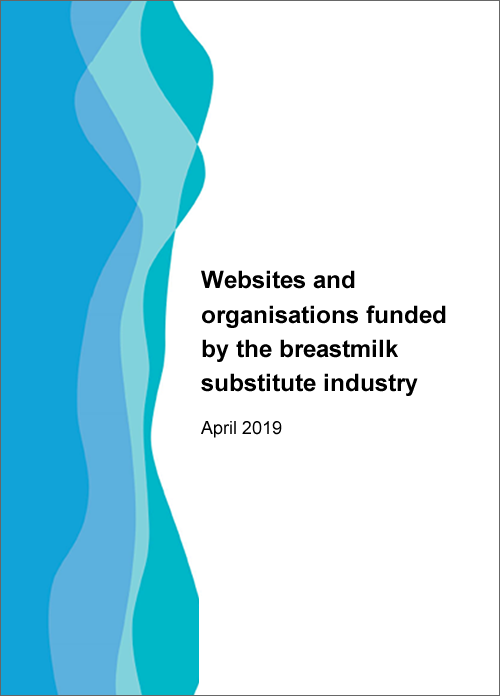 This provides information on good sources of information on infant and young child feeding, as well as highlighting websites and organisations that are funded or work in partnership with the BMS industry. If anyone comes across other websites or projects not featured here do let us know. The Baby Feeding Law Group (BFLG) was set up over 20 years ago with the aim of protecting babies’ health by ending marketing practices which commercialise infant feeding and threaten breastfeeding. BFLG UK is working to strengthen UK baby feeding laws in line with UN recommendations, and currently has over 20 member groups who share the aim of bringing the WHO Code of Marketing of Breastmilk Substitutes and subsequent relevant WHA resolutions into UK law. First Steps Nutrition Trust has taken over the secretariat role for BFLG during 2019 and have been working with the membership to agree a new terms of reference for the group and priorities and actions for the coming year. We will also be launching a new website shortly (with a new simpler web address) and have a new twitter feed @bflgUK. Lactation Consultants of Great Britain conference in Daventry. Institute of Health Visiting ‘Health for all children’ conference in Manchester. Association of Breastfeeding Mothers 40th anniversary conference. And later in the year we will be at the CPHVA conference in October and the Unicef Baby Friendly Conference in November. The next First Steps Nutrition Trust conference will be in April 2020. First Steps Nutrition Trust offers information and resources to support good nutrition from pre-conception to 5 years. Our aim is to produce clear and independent resources to support people who want to know more about eating well before and during pregnancy, eating well for infants and young children, and food composition and food quality. First Steps Nutrition Trust takes no industry funding and fully supports the WHO Code of Marketing of Breastmilk Substitutes and subsequent World Health Assembly Resolutions. We are funded through grants and donations. We aim to provide a one-stop shop for useful and accurate evidence-based information on good nutrition from pre-conception to five years. To find out more about the Trust, visit our homepage.